There are many reasons why people create miniature worlds; there is a marvel to the activity that truly thrills the soul. 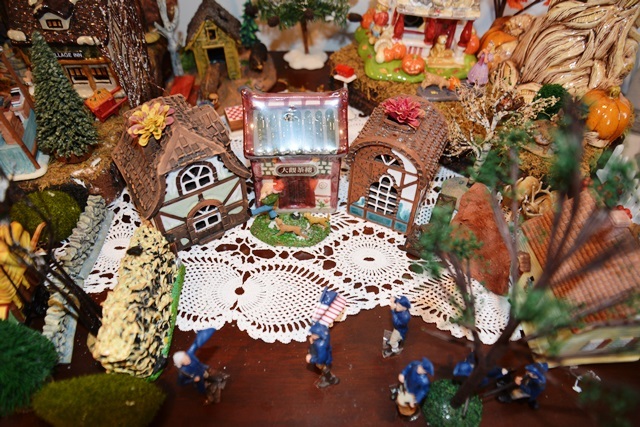 As I have already written about, on these pages, the Christmas Village began during Kate and my first Christmas together, in 1987, in Long Beach, California. I saw the original six houses in a Lillian Vernon catalogue and splurged, without regret! 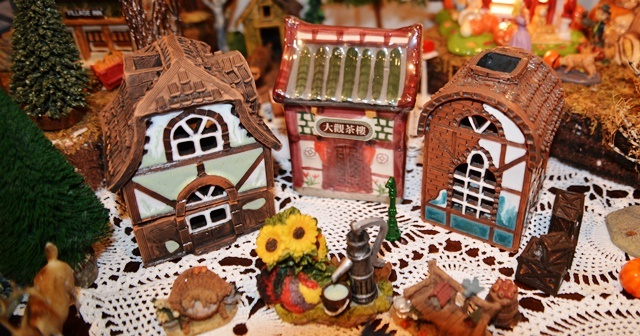 The Fall Village began when I found five buildings at the Goodwill in Biddeford, Maine. 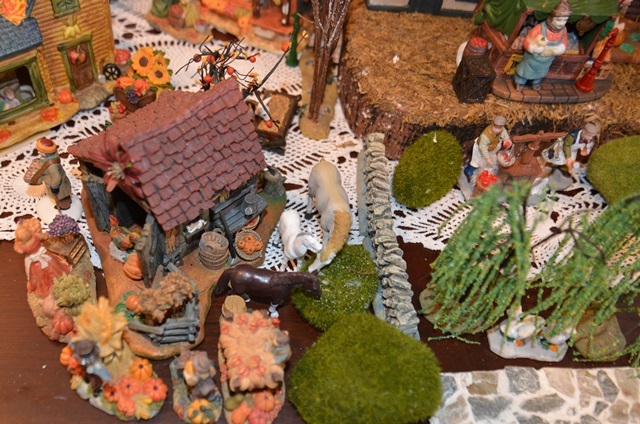 I knew I could not work them into the Christmas Village, they were simply too “orange”. Nevertheless, I took the plunge, also without regret, especially now. Recently, I walked over and saw my eldest great-niece, Annaka, playing with the Fall Village, as I engaged her, she had the most wonderful smile on her face and her eyes were filled with wonder and yes, marvel! The first thing she said to me was “Look, I gave them flowers!” She had indeed decorated the houses with flowers! I loved it. I then asked her which house was hers, where she lived in the village. Traditionally, when I introduce someone to the Christmas Village, for the first time, I always ask them where they live and where they work. As Annaka is only six years old, I did not ask her where she worked. She pointed to the white house on the hill, and then said “Look, I gave them pumpkins.” As she took me to see the space behind the house, where she had gathered all of the pumpkins, spread throughout the village. Oh my, talk about marvel! I asked her if she was the little girl in the pink dress with the puppy that was eating the pumpkin; she said yes, but believes it is a goat, not a dog. She is of course correct, as this is her vision of the Village. As I looked through the changes Annaka had made, I thought about how this is exactly why one builds such things as villages. I would have been beyond thrilled to have access to some such playground, as a child; I did not, but what a blessing to be able to share it with my great-niece. Yes, my thoughts do get a bit ahead of the moment, as I looked at Annaka’s village, and listened to her excitement, and proclamation that she was looking forward to playing with the Village again, I thought next year, we are going to have to schedule a “building date” when Annaka can come over and lay out the Fall Village, with her vision! 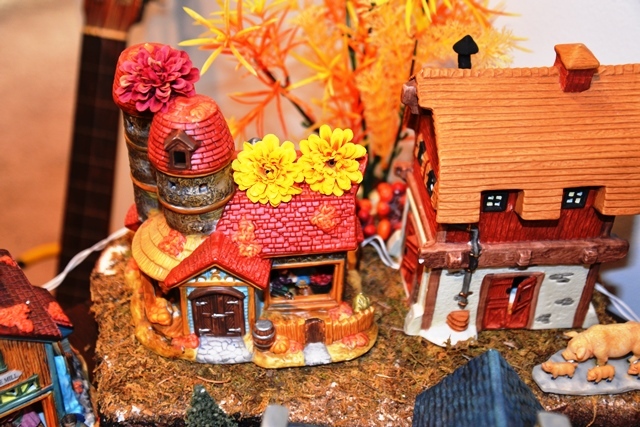 Last year, I added a small piece to the autumn village, which I called a solarium; along with the tea house. I had found it at a second hand store, been intrigued; as it was not like anything I had seen before, deciding it must be something placed over a votive. 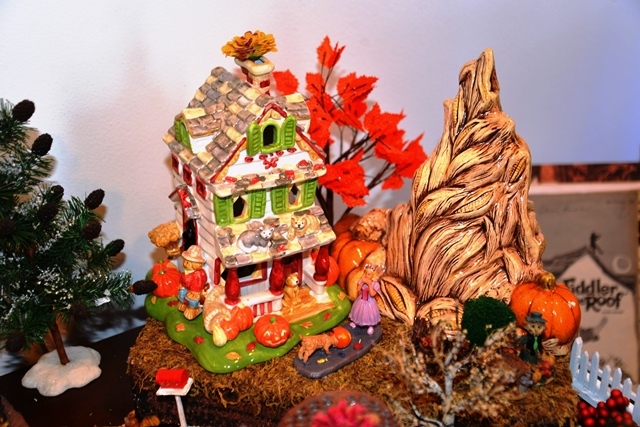 It is made from clay, very detailed, and adorned with what seems like ceramic glaze. 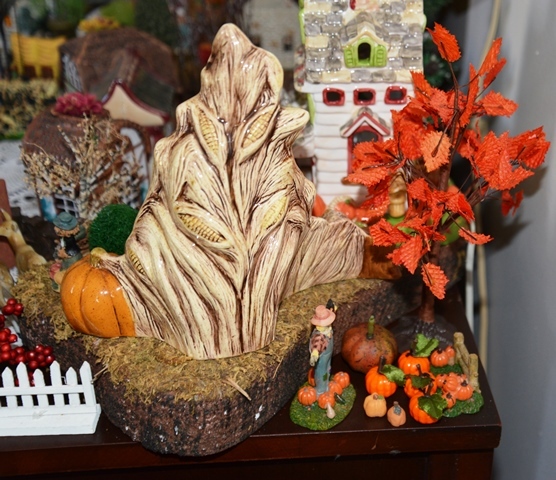 When I bought it, I assumed I would use it as a votive, but its color scheme matched the autumn village, thus that is where it found a home. Recently, I ventured into Goodwill, and found my newest addition; I was drawn to it because it reminded me so much of my solarium. 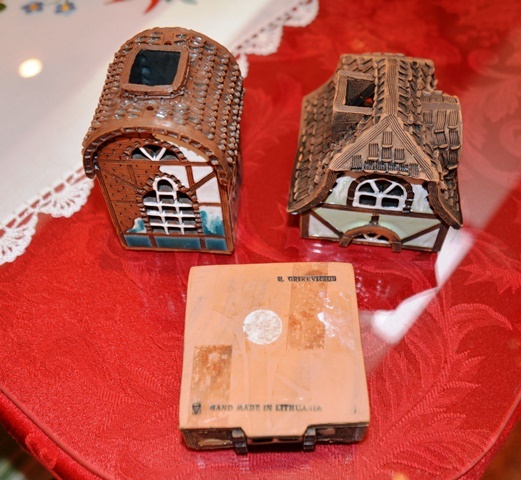 On the bottom of what I am calling Caroline’s Cottage, I found stamped “Made in Lithuania”. Lithuania? Lithuania! To my knowledge, this is my first Lithuanian treasure. As I cleaned up my new piece, and found a place for it, in the autumn village, I was struck by how indeed similar it is to my solarium. I have concluded that the solarium must be missing its base. Nevertheless, I am quite happy with the solarium and with Caroline’s Cottage; I do keep telling myself I will add no more to this village, but somehow Caroline’s Cottage seemed too special leave behind and lets face it, there is always room for one more person or piece in our life! Knowing what I had found, I have now been able to do a little research, and it turns out that Lithuania votive holders are ceramic handmade works of art, that can be purchased on the internet, if you are so inclined! 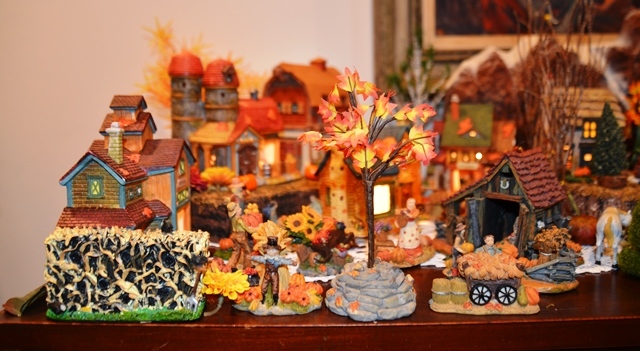 This year, I have borrowed more elements from the Christmas village, all that will be returned, in about six weeks; oh my I was not ready for fall, it is hard to believe winter will here that quickly. This entry was posted on November 26, 2018 at 1:00 am and is filed under Because I Can, Holiday's, SlideShow. You can follow any responses to this entry through the RSS 2.0 feed.